World-changing ideas meet eye-catching design: the best titles of the extraordinarily successful Great Ideas series are now packaged in Coralie Bickford-Smith’s distinctive, award-winning covers. Whether on a well-curated shelf or in your back pocket, these timeless works of philosophical, political, and psychological thought are absolute must-haves for book collectors as well as design enthusiasts. The Communist Manifesto, Marx and Engels's revolutionary summons to the working classes, is one of the most important and influential political theories ever formulated. After four years of collaboration, the authors produced this incisive declaration of their idea of Communism, in which they envisage a society without classes, private property or a state. They argue that increasing exploitation of industrial workers will eventually lead to a revolution in which Capitalism is overthrown. This vision provided the theoretical basis of political systems in Russia, China, Cuba and Eastern Europe, affecting the lives of millions.The Communist Manifesto still remains a landmark text: a work that continues to influence and provoke debate on capitalism and class. Karl Marx was born in Trier, Germany and studied law at Bonn and Berlin. 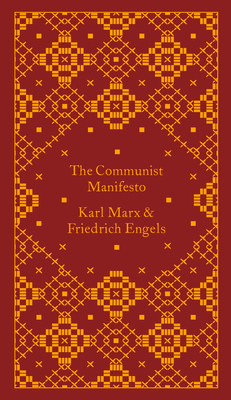 In 1848, with Freidrich Engels, he finalized The Communist Manifesto. He settled in London, where he studied economics and wrote the first volume of his major work, Das Kapital (1867, two further volumes were added in 1884 and 1894). He is buried in Highgate Cemetery, London. Friedrich Engels was born in Westphalia in 1820, the son of a textile manufacturer. After military training in Berlin, Engels already a convert to communism, went to Manchester in 1842 to represent the family firm. A relationship with a mill-hand, Mary Bums, and friendship with local Owenites and Chartists helped to inspire his famous early work, The Condition of the Working Class in England in 1844. His collaboration with Marx began in 1844 and in 1847 he composed the first drafts of the Communist Manifesto. After playing an active part in the German revolutions, Engels returned to work in Manchester until 1870, when he moved to London. He not only helped Marx financially, but reinforced their shared position through his own expositions of the new theory. After Marx’s death, he prepared the unfinished volumes of Capital for publication. He died in London in 1895. Gareth Stedman Jones is Professor of Political Science in the History Faculty of Cambridge University and a Fellow of King's College, Cambridge. He is also a Director of the Centre of History and Economics at Cambridge. His publications include Outcast London and Languages of Class.